On the 1st (Wed), take in the spiritual surroundings of Paradesi Synagogue and then don't miss a visit to Chinese Fishing Nets. To see photos, reviews, ratings, and tourist information, use the Kochi (Cochin) trip builder website . New Delhi to Kochi (Cochin) is an approximately 5.5-hour flight. You can also do a combination of flight and bus; or drive. Traveling from New Delhi in May, you will find days in Kochi (Cochin) are little chillier (38°C), and nights are about the same (30°C). Wrap up your sightseeing on the 2nd (Thu) early enough to travel to Thiruvananthapuram (Trivandrum). On the 3rd (Fri), contemplate in the serene atmosphere at Sreekandeswaram Mahadeva Temple, contemplate in the serene atmosphere at Sree Padmanabhaswamy Temple, examine the collection at Puthenmalika (Kuthiramalika) Palace, then visit a coastal fixture at Vizhinjam Lighthouse, then make a trip to Attukal Bhagavathy Temple, and finally don't miss a visit to Pazhavangadi Ganapathy Temple. To see where to stay, reviews, other places to visit, and more tourist information, go to the Thiruvananthapuram (Trivandrum) trip website . Fly from Kochi (Cochin) to Thiruvananthapuram (Trivandrum) in 3 hours. Alternatively, you can drive; or take a bus. In May, daytime highs in Thiruvananthapuram (Trivandrum) are 37°C, while nighttime lows are 30°C. Cap off your sightseeing on the 3rd (Fri) early enough to travel to Bengaluru. 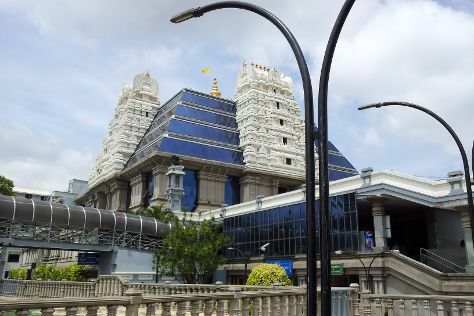 Kick off your visit on the 4th (Sat): test your team's savvy at popular escape rooms, then admire all the interesting features of M Chinnaswamy Stadium, then contemplate in the serene atmosphere at ISKCON Temple Bangalore, and finally wander the streets of Malleswaram. Plan my Bengaluru trip by asking Inpirock to come up with tips and suggestions. Getting from Thiruvananthapuram (Trivandrum) to Bengaluru by combination of flight and bus takes about 3.5 hours. Other options: drive; or take a bus. Traveling from Thiruvananthapuram (Trivandrum) in May, you can expect nighttime temperatures to be slightly colder in Bengaluru, with lows of 26°C. Cap off your sightseeing on the 4th (Sat) early enough to travel to Goa. Kick off your visit on the 5th (Sun): wander the streets of Fontainhas and then look for gifts at Sheek Emporium. For maps, photos, more things to do, and tourist information, go to the Goa day trip planning tool . Traveling by combination of flight and taxi from Bengaluru to Goa takes 4.5 hours. Alternatively, you can do a combination of flight and bus; or drive. Expect somewhat warmer evenings in Goa when traveling from Bengaluru in May, with lows around 32°C. Wrap up your sightseeing on the 5th (Sun) early enough to travel back home.